Oh Penni had a little lamb. Little lamb, little lamb. Penni had a little lamb. Its fleece was white as snow. And everywhere that Penni went. Penni went, Penni went. Everywhere that Penni went. The lamb was sure to go. She took the lamb to school one day. School one day, school one day. She even took it to school one day. And they ate some donughts ohhhh! 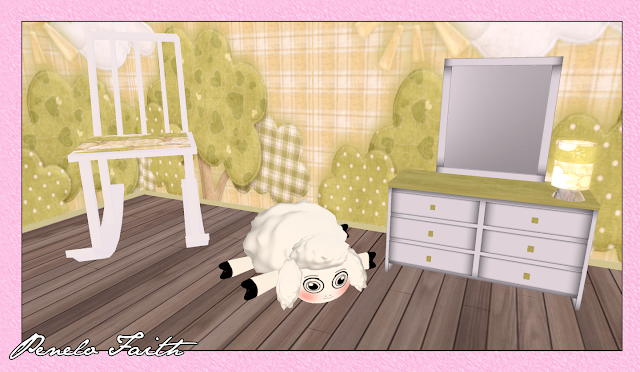 The Play Room by Seraphim items are available until the end of May. Now you will have to excuse my mistake! Now maybe you didn't notice but maybe you will but little me didn't notice that I didn't lay my bed on the bed frame completely .... so it is floating a bit in the picture - grumbles a little - BUT unlike me your parents/you can properly place your mattress on your bed frame for a perfect fit. You can pull up your quilt and be as snug as a bug under a rug! Or they say something like that!